With over 40 years experience in the window and door industry, The Window Surgeon has established itself as one of the leading window repair and installation companies in Coventry and Warwickshire. Our skilled team specialise in providing bespoke solutions for all your window and door needs without compromising on quality, workmanship or customer service. With our expertise in UPVC repairs and spares, The Window Surgeon has built a solid reputation for all double glazing repairs including broken down glass units, faulty hinges and locks for windows and doors, conservatories and much more. By providing a service which focuses on providing a solution to repair the majority of faults as an alternative to replacing your frames for completely new windows , our friendly team has grown from strength to strength and now covers a large area across the Leamington, Warwick, Nuneaton, Coventry and the surrounding areas. Whether you require a replacement handle to a single door or a number of complete replacement windows, The Window Surgeon has the team, expertise and experience to deliver your UPVC repairs and spares! Whether your door handle is loose, stiff, broken or experiencing a fault in any way. The Window Surgeon can provide a solution for you. Adjustments, repairs and replacement door handles can often be repaired on site . Faulty or broken window handles can usually be changed with the minimum of fuss. Doors and windows often become stiff, or difficult to operate after time and often can be caused by the components hinges. A draughty window is often a sign that the hinges have come to the end of their lifespan. The replacement, adjustment or repair of hinges is a fast and reliable option to ensure that your windows and doors are fully functioning for years to come. As well as offering a full repair service we can also supply spare parts such as window handles and hinges, letterboxes, door barrels and locks. Just bring your broken part in to our office off Kingswood Close, and we will do our best to find you a new one! Lots of parts are available in stock, some can be sourced “next day”, and many are easy to replace! 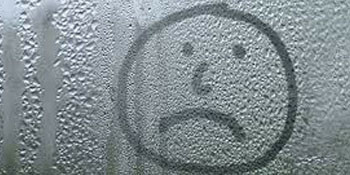 Condensation occurs between the glass unit when the seal between the double glazing fails, as a result, moisture is able to get between the glass and condense leaving the unit misted and stained. The Window Surgeon can remove the existing glass unit and replace with new, the process is quick, easy and affordable. Patio Door Not Running As Smoothly As It Used To? If your sliding door is stiff or difficult to open, then the rollers may be causing the problem. Often the rollers become blocked with dirt and wear out, making it difficult to open the door. If you have an older sliding glass door your rollers may have become rusty because sliding door units did not always use stainless steel rollers. The track can often be replaced if necessary. We offer a full repair service, or alternatively we can supply you with the spare parts. Just send a photo of the parts you need and we will source them for you. Contact us to request a quote. Please send photos of your broken parts, or glass units to admin@windsealdoubleglazing.co.uk and one of the team will get back to you with a cost to repair!